I just finished reading Ron Lieber’s book The Opposite of Spoiled. Lieber is the personal finance columnist for The New York Times, and this highly-readable and helpful book is subtitled, Raising Kids Who Are Grounded, Generous, and Smart About Money. 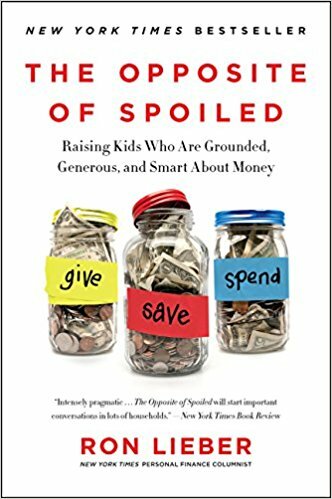 You can get full reviews other places, but I would simply like to give a quick overview of the book and share some of the best tips to help parents in raising kids who are financially grounded and generous. This is one way to give your children a healthy perspective on living life generously. As a brief mini-review, The Opposite of Spoiled is engaging, packed with tips and stories, and very easy to read. Lieber opens with an important discussion of why we need to talk with our kids about money (this chapter is one of the highlights of the book, and convicting as a parent). He then proceeds with tips and examples on how to start talking to your kids about money, whether to do “allowance”, and helping kids think through the wisdom of their purchases. The last half of the book takes on topics of children and materialism, giving, work, and priviledge. This is done without any sort of overbearing “thou shalt…” perspective; instead, he chooses to simply share a lot of stories gleaned from readers of his columns over the years. This has the advantage of keeping his message open to people of just about any background, class, or faith. To my mind, however, although the stories were interesting, the last half lacks the punch of the first half because Lieber won’t fully advocate for specific ways to be generous, avoid materialism, and work. Where the book really succeeds is the first half, with specific tips on how to talk to your kids about money. The idea is to introduce children to financial concepts and responsibilities at early ages, so that by the time they are ready to take on school loans or car payments or the abundance of a full-time paycheck, they are ready to handle it well. Here are some of the most impactful tips from the book to help you teach your kids financial responsibility. When kids ask money-related questions, whether it’s for us to buy them something, about our income, about why others are different, etc, it may feel easiest to fib. “We can’t afford it” is a common one, as is “I don’t have any money.” The trouble is, children will quickly figure out that these are untrue. Often we really can afford it, and we do in fact have access to payment through a debit or credit card. The truth is we just don’t want to buy it. This may be for a valid reason – we’d prefer to save up for a family vacation, or we’re choosing to take the family to the movies, or we’re putting it in savings, or we’re helping out a friend or family member. Lieber argues that, as long as the child can understand the concepts, it’s far better to tell them the truth about why we do or don’t buy particular things (or drive certain types of cars, etc) rather than to lie to them about it. This helps build trust with the child. At the same time, it takes away a screen of fiscal secrecy and opens up to the child ideas of spending, saving, and budgeting at an early age. 2. Did you ask a good question today? This simple trick conveys to them that asking good, thoughful questions is an important part of life, and even a highlight. It is one simple way to encourage them to ask questions at school, at home, and anywhere else. Here is another iteration of The Golden Rule. When thinking through your choices as a consumer, include this question: Which one does the most good and the least harm? Of course the deeper question beneath that is, good for whom? Harm to whom? This can be your local community, the environment, animals, and more. Two examples are provided in the book, the first being the clothing company Abercrombie & Fitch, which fired a teenage employee for wearing an Islamic headscarf and sells shirts to young girls with messages like “Who needs a brain when you have these?” across the chest. Perhaps you avoid companies like this; why not share with your children why you choose to put your clothing budget elsewhere? The second example is for children who play in Little League, they may want to consider channeling their spending and giving funds to businesses and organizations that help sponsor local baseball teams. This keeps money within the local community, and rewards businesses that have a charitable and productive presence in the area. Lieber dedicates an entire chapter to the question on allowance. Many parents don’t seem to like the idea of giving an allowance outright; often, the allowance is tied to household chores. The trouble is, the chores have to be done regardless of whether an allowance is given or not. If a child loses their allowance, they will often still have to do their chores. Work for no pay isn’t exactly the life lesson most parents are thinking about when they initially tie chores and allowance together. Additionally, children will see that adults do chores and they don’t get paid directly for it, so the “real life” aspect of the chores=allowance scheme starts to break down the more closely you look at it. The entire chapter is definitely worth reading, but one quick takaway is the following solution one parent offered in an online journal article. The idea is to teach children to think entrepreneurially and creatively. Instead of an allowance for chores, kids get paid for recognizing problems and solving them. Examples include identifying that the leaves need to be raked or a car needs to be washed. The solution? Rake, or wash! The author of the article eventually ended up helping his son with a business plan for the youngster’s side hustle of washing neighborhood cars. As mentioned above, the first half of the book is more hands-on and helpful than the second half. It includes the tips mentioned above and much more, and is highly recommended. The second half of the book is a little less directly practical, but contains many inspiring stories of how others have learned to move out of the grip of materialism and into a generous and thankful lifestyle. If you have children and are wondering if and how to introduce concepts of money, saving, giving, and budgeting in practical, age-appropriate ways, this is the book for you.